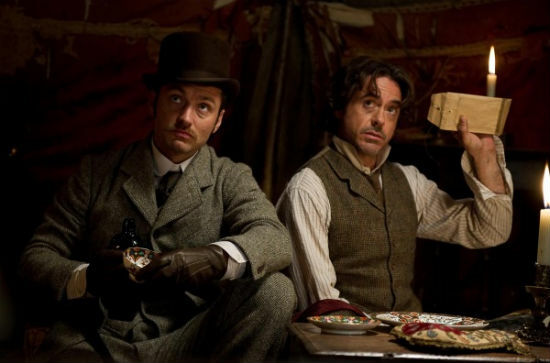 The Robert Downey Jr.-powered “Sherlock Holmes” franchise, like the “Transformers” franchise, makes me feel very, very old. Both series are hugely successful. Apparently they make other moviegoers terribly happy. But they leave me feeling…empty. For all their visual razzle dazzle, there’s no there there. I might as well be beating myself over the head with an inflated pig bladder for all the pleasure these movies provide. I know, I know. What a disagreeable old man I have become. It’s not that I cannot appreciate superficial charm. But these movies aren’t charming. Just superficial. Under the direction of Guy Ritchie, this “Sherlock” continues the hyperventilated mood, style and lack of substance established by the first effort two years ago. The plot centers on the effort by Holmes (Downey) to track down and stop his arch-nemesis Professor Moriarty (a suprisingly effective Jarod Harris), who has gone into arms manufacturing in a big way and is planning on sabotaging a peace conference and plunging Europe into a disastrous war from which he will hugely profit. That’s about all I can say with any assurance, because most of “Game of Shadows” is spent with the characters running hither and yon. I was usually in the dark about just what they were trying to accomplish at any given time. The Holmes given us by Conan Doyle was erudite and eccentric; Downey’s version is manic and a bit mad. Lest I be accused of old fartism, let me say that I’m no great fan of the Basil Rathbone Sherlock Holmes movies of yesteryear. With the exception of “The Hound of the Baskervilles” (which generated a fair share of horror), I find them pretty boring. So I’m all for a bit of innovation…I especially like the modern-day Sherlock played by Benedict Cumberbatch in the new PBS series. But the Ritchie/Downey Holmes is too busy, too shallow. I mean, who’d associate Sherlock Holmes with short attention spans? One thing about this new Holmes effort does work…Jude Law’s Watson. Law left me cold the first time around (in recent years I’ve started to doubt his acting skills), but here he finds the right blend of tolerant friend, sober man of science and — though he wouldn’t admit it — gleeful adventurer. Other key players include Noomi Rapace (of the Swedish “Girl with the Dragon Tattoo”) as a gypsy fortune teller (she makes virtually no impression); Rachel McAdams, briefly reprising her role as actress/adventuress Irene Adler (she struck me as a little girl playing dressup in mommy’s clothes) and Kelly Reilly as Watson’s new bride (she makes the most of her few scenes). Ritchie’s directing style is all headlong rush. Which would be OK, I suppose, if he could convincingly stage action. But the fight scenes in “Game of Shadows” seem to have been edited by someone suffering from St. Vitus Dance. They’re incoherent.